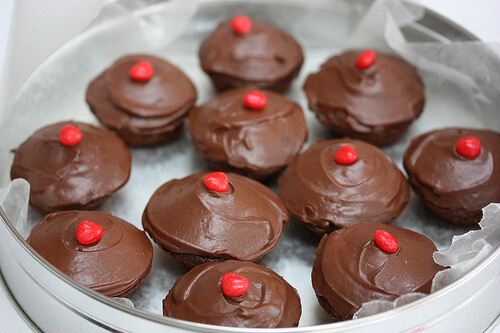 Makes 24 Mini Cupcakes – for an instructional video click here! Place the sugar and oil in a large bowl and beat at medium speed until well blended, about 1 minute. Add the eggs, blueberries (and their juice), milk, and vanilla extract, and continue to beat on medium until the blueberries are broken up a bit and well incorporated, 1 more minute. Scrape down the sides of the bowl if necessary. In a separate bowl, whisk together the all-purpose flour, whole wheat flour, cocoa powder, baking powder, and salt. At low speed, gradually beat the flour mixture into the liquid mixture until just combined. Stir in the chocolate chips. Spoon the batter evenly into the prepared muffin cups, filling almost to the top. Bake for 15 minutes, or until a toothpick inserted in the center comes out clean. Transfer the pan to a wire rack and cool for 5 minutes. Remove the cupcakes and cool completely before frosting. (Note: Depending on the size of your muffin cups, you may have some batter left over. Feel free to bake up a second small batch of cupcakes with any leftover batter). To make the frosting, place the powdered sugar, cocoa powder, buttery spread, milk, and vanilla extract in a bowl and beat at low speed until blended. Raise the speed to medium once the sugar is incorporated and continue to beat until creamy. Spread the frosting over the cupcakes, and garnish as desired with a red candy or conversation heart. * If you use a 12-cup muffin tin, you’ll want to bake the cupcakes for about 20 minutes.